The controversy surrounding the membership of Dr. Ezenator Agyemang Rawlings has been put to rest. The daughter of former President John Jerry Rawlings was on Thursday cleared by the leadership of the ruling National Democratic Congress (NDC) to contest the party’s upcoming parliamentary primaries. 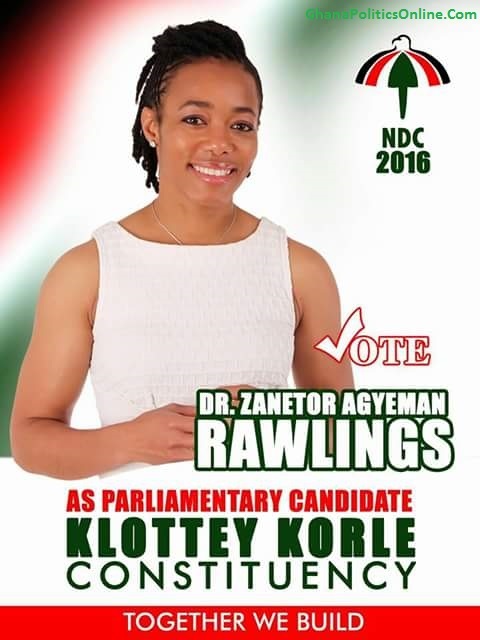 Ezenator’s membership as an ‘akatamansonian’ had been at the center of discussions among party functionaries in the Korle Klottey Constituency from the very day that she decided to contest the seat on the ticket of the party. The constituency executives were sharply divided as to whether she was a card bearing member of the umbrella family. While some were of the view that she be given the chance to contest, others insisted she was a stranger in the constituency because she was not a card bearing member of the NDC. The discussion was temporarily put to rest when the constituency Youth Organiser, Charles Gben came to her rescue by revealing that she was a card bearing member of the party. Ezenator Rawlings, he said, does all her party activities and as well pays her contributions to the Ridge Church branch, Ring Way Ward, of the NDC. “She bears a party card and belongs to a branch in the constituency. She pays her dues and that means that she is a recognized party member in the constituency,” he told Fiifi Banson in an interview on Kasapa 102.3 FM. Ezenator’s chance of beating the incumbent, Nii Armah Ashitey, also an ‘akatamansonian’ was further given a boost when the National executives cleared her to contest the race. The NDC is expected to go to the polls in November to decide on candidates for the 2016 Presidential and Parliamentary elections. Anas is dating late JB Danquah’s wife - Kennedy Agyapong?